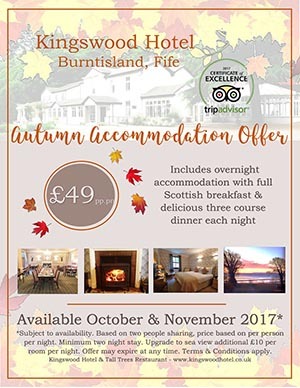 Enjoy all the hospitality of the Kingswood Hotel in Fife for only £49 per person per night. Offer is available through October and November subject to availability. Price is based on two people sharing for a minimum two night stay. Offer includes overnght accommodation with full Scottish breakfast & delicious three course dinner each night. Terms and conditions apply.